Hurricane Bonnie formed out of a poorly organized tropical depression east of the Leeward Islands on August 19, 1998. The new tropical storm then moved west-northwest, passing north of the Antilles, and reached hurricane strength north of Puerto Rico on August 22. Hurricane Bonnie then turned to the northwest, away from the Bahamas and Florida, and toward the Carolinas. Bonnie strengthened into a 115 mph Category 3 hurricane, and retained this strength until just before landfall on August 27, 1998 near Wilmington, North Carolina (Figures 1 and 2). As it moved over land, it continued an eastward turn started just before landfall, and returned to the Atlantic as a tropical storm. Bonnie once again strengthened to a minimal hurricane, but weakened as it headed rapidly to the northeast. Bonnie became extratropical on August 30 while about 240 miles south-southeast of Newfoundland. Hurricane Bonnie was blamed for three deaths, and $720 million (1998 USD, $970 million 2011 US Dollars) in damage, most of it in the Hampton Roads area of Virginia. Bonnie was the third hurricane to directly hit North Carolina in a three year span. Figure 2. 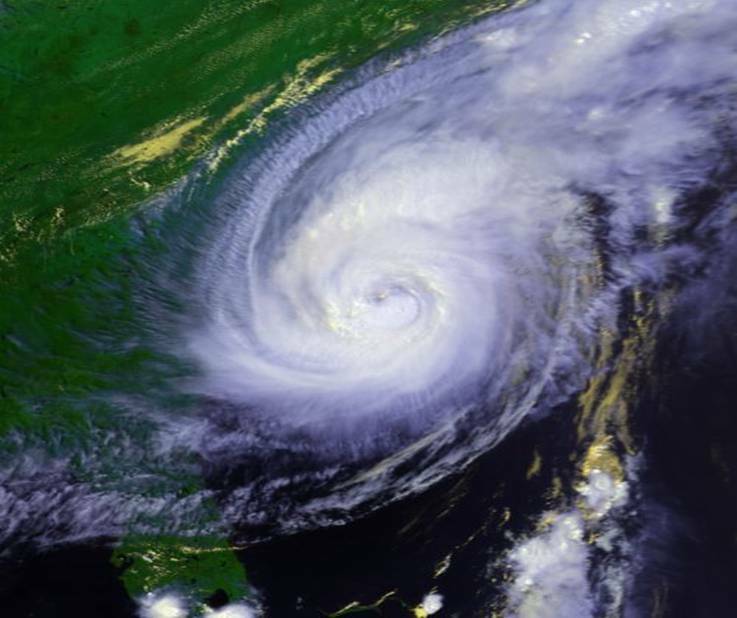 Hurricane Bonnie making landfall near Wilmington, NC late on August 26, 1998. On August 24, 1998, Hurricane Warnings were posted from Murrells Inlet, South Carolina to the North Carolina – Virginia border. About 815 guardsmen were called to North Carolina, where they assisted local authorities with the extensive preparations, including evacuating 750,000 state citizens. Mandatory and voluntary evacuations were ordered. The Outer Banks experienced extensive evacuations with at least 300,000 leaving, bringing traffic on highways from there to the mainland to a standstill. Hurricane Bonnie came ashore as a strong Category 2 hurricane (Figure 3) late on August 26. Wind gusts of 98 mph were observed in the Wilmington area. Offshore at the Frying Pan Shoals Light Tower, winds reached 104 mph. The strongest winds were found in the precursor rainbands, where localized downbursts caused severe damage. Rainfall was heavy as a result of the storm's slow movement, peaking at 11 inches at Jacksonville, NC while several totals of over 10 inches were reported. However, because the area had been experiencing drought conditions, the flooding was not as severe as it could have potentially been. The most significant flooding occurred near the Cape Fear River, where high waters were reported. The highest storm surge occurred along the beaches of Brunswick County, mostly reaching 5 to 8 feet above average. Elsewhere, flooding was mostly limited to locations with poor drainage and low-lying areas. Coastal flooding was not widespread, although the surge in the Pungo River flooded several local homes. Parts of North Carolina Highway 12 were flooded and closed on Hatteras Island due to tidal flooding. Along the Bogue Bands, tens of thousands of tires, which were part of an artificial reef, were washed ashore. There were numerous reports of many trees down, roof and structural damage and widespread power outages primarily in eastern North Carolina and Virginia where a federal disaster was declared for several counties. Up to 500,000 residents lost power due to Bonnie. A brief tornado touched down at the Duke Marine Lab in Beaufort, causing minor damage. Another tornado was reported in the town of Edenton in Chowan County. One direct death occurred in North Carolina when a young girl was killed when a tree fell on her Currituck County home. Numerous docks and piers were either damaged or destroyed, including the Iron Steamer and Indian Beach piers, which both lost large sections to the strong wind and surf. Crop, particularly tobacco, damage was extensive. Overall, property damage in the state is estimated at $240 million (1998 US Dollars), with significantly higher crop damages. On North Topsail Beach, many of the protective dunes constructed after Hurricane Fran in 1996 were destroyed as the storm breached 27 sand dunes, destroying 60% of the dune line. Strong waves ran through the foundation of two stilted homes, both of which were later reinforced to compensate for the lost sand. The Property Claim Services Division of the American Insurance Services Group reports that Bonnie caused an estimated $ 360 million in insured property damage to the United States. This estimate includes $ 240 million in North Carolina, $ 95 million in Georgia, and $ 25 million in South Carolina. A conservative ratio between total damage and insured property damage, compared to past landfallinghurricanes, is two to one. Therefore, the total U.S. damage estimate is $ 720 million. Figure 3. Hurricane Bonnie making landfall in Pender County around 9 pm on August 26, 1998. Tree damage from Hurricane Bonnie in the Morehead City area, August 27, 1998.